With more people choosing or finding the necessity to work from home, the home office furniture and equipment ranges are booming, after all, what better way to work to your fullest potential than in absolute comfort, in your own home. 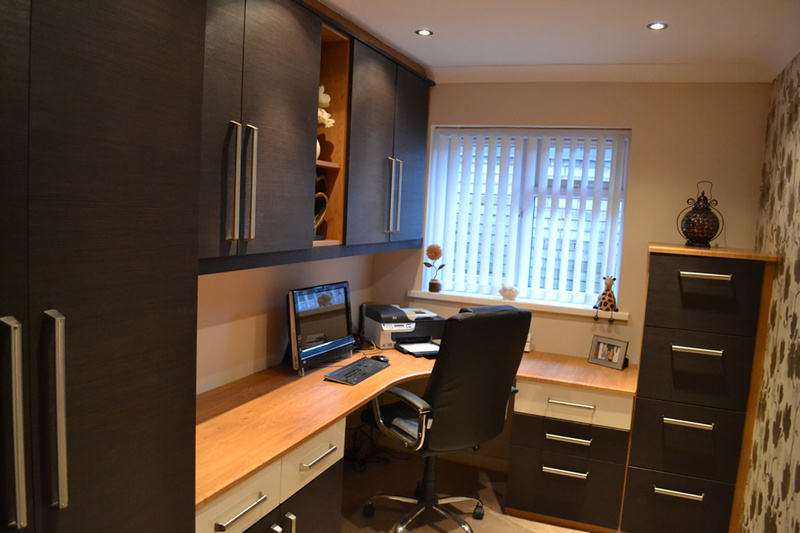 Through ingenious planning we can build you a home office that works with you and will blend into your home and work lifestyle. We will personally design your office with you in mind to be both functional and stylish and then incorporate organised storage, which will provide you with a calm and productive work area. We can provide all the necessary housing for computers, monitors, printers and ancillary equipment, including an optional slide out keyboard creating extra desk space. All wires and cables are safely stored away into cable ports keeping them tidy and helping to avoid safety hazards such as tripping over trailing leads. For added security, we can also design filing cabinets and storage solutions that are lockable, which is perfect for confidential or sensitive paperwork that you want to keep safe. Proud of our fantastic design service, we offer an extensive range of designs using over 50 different colours, along with a whole catalogue of accessories, such as handles. We can personally tailor your office furniture to suit your home design and individual tastes, creating your ideal home office. Helps you to work more safely: The health and safety guidelines you find in offices, apply at home too. Things like the height of your monitor, your lumbar support, taking regular breaks, etc. are all very important for your health. Setting up a home office will help you to make sure you follow these health and safety guidelines correctly. Helps you to focus better: Having your own space, preferably in a quiet area of the home and away from the distracting television, will help you to focus on work more and get side-tracked less, making you work more efficiently. Helps you to do things quicker: Creating an office space will make sure you have everything you need to hand, stationary, a printer/scanner, paperwork, all will be readily available for you and you’ll know exactly where it is. Sitting on the sofa to work on the other hand, means you have to get up to get the things you need, which you may have to look for if they don’t have ‘somewhere to live’. Helps you to become more organised: Workers are more productive when things are organised, this is a fact. An office space will help you to organise your paperwork, equipment, stationary etc. and enable you to get started on work, the second you sit at your desk. Looks much more impressive: Rather than having leads and bits of office equipment littered all over your living room, you’ll be able to keep everything in your home office, helping to improve the look of your living areas. What’s more is, you’ll also have a unique and personally designed home office to show off. 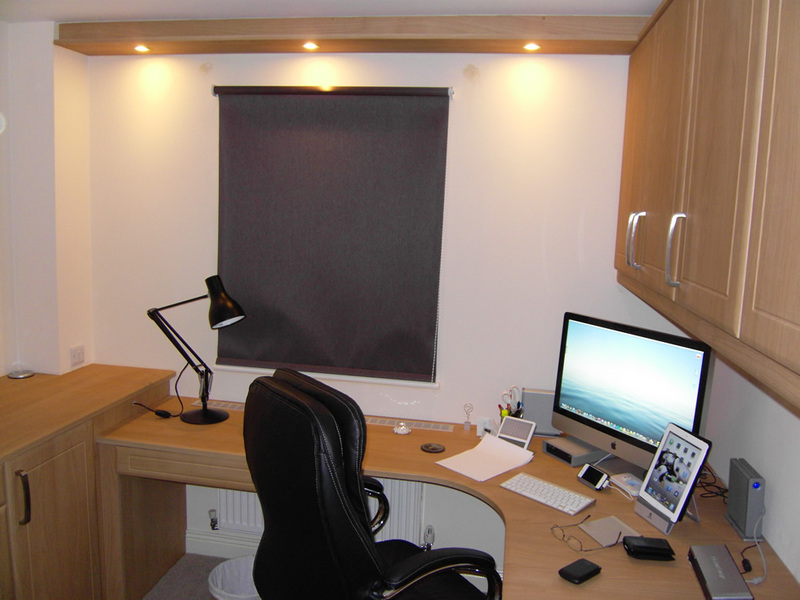 Now you know the many benefits of creating your own home office, what are you waiting for? Contact one of our expert team now and see how we can help you to create your perfect office space.